Great savings on top quality wooden blinds made from fine timbers showing beautiful natural wood grains and available in 25, 35 and 50 mm slats with optional stylish ladder tapes. All our wood venetian blinds come with 3 years guarantee as standard and we offer best prices online. 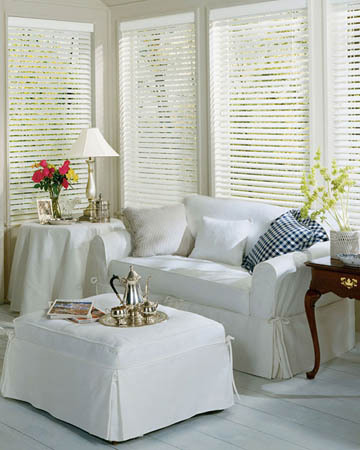 We will not be beaten on price for made to measure wooden blinds! Wooden blinds are usually sold in either vertical and venetian style and come finished in natural tints, stained to create interesting visual effects, brushed and oiled for a matt finish or lacquered for a shiny top layer and can be close grain sanded for highly smooth slat surfaces or finished with special techniques to create a distressed look all to cater to all types of preferences and to fit against any window frame in residential areas. The quality finished real wood window blinds we sell come with slats measuring 25, 35, 50 or 63 mm in width for the venetian wooden blinds collection and 89mm wide louvers for the vertical line of wooden window blinds. High precision machinery ensures all slats are exquisitely finished in order to enhance the natural appeal of the wood grain and that the resulted products are lightweight, thin to reduce the weight of the blind as well as the stack size. 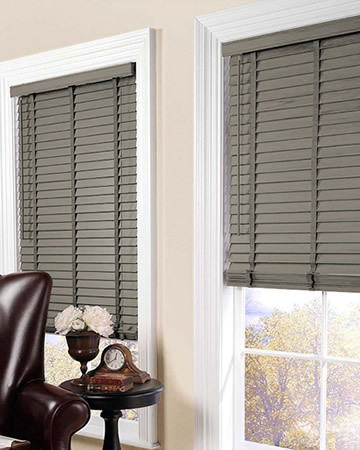 We bring forth a wide range of wooden blinds from natural finished basswood blinds to fully painted wood slat blinds and from stained slats to emphasize the look of the grain to distressed finishes for an astonishing look. Taking into account the uniqueness of the blinds industry, it is important to remember that wood essences names can be named differently depending on finishes, that is why a product names Walnut will not necessarily be made out of walnut timber, but from a lighter essence such as basswood. However, since we offer premium bespoke wood blinds we also have a line of real wood blinds made of genuine European oak which are marked as such. Since we sell made to measure wooden blinds, customers can easily decide on the numerous features available for this product online: custom width and drop in order to accommodate any type of window: be it extra large, bay type window or even glass doors, decorative tapes in a variety of colours to match or contrast the overall look of the blind to replace the colour coordinated ladder tape, wood pelmet with returns for outside recess mounting as well as personalized positioning of manual controls. Wooden blinds are known for their high energy efficiency rating and are a decorative and functional addition to any home interior and, given our continuous effort to bring forth affordable yet high quality items, they are also an affordable alternative for home improvement. For best results we recommend that customers request samples prior to placing an order if colour matching to other wooden items is required. Our wide array of made to measure wooden blinds come with free samples and even next day delivery in the UK on selected products. Real wood window blind designed to bring the natural beauty of wood into your home or into your office. 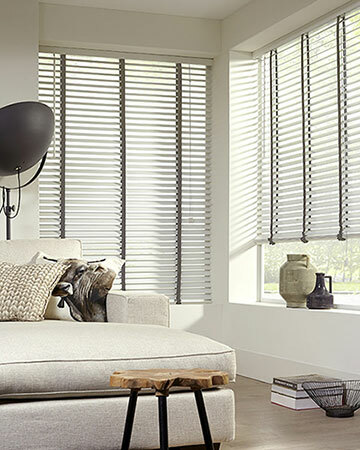 Our made to measure wooden venetian blinds are natural, stylish and warm and they are made of quality timbers. These products are made according to your sizes and delivered free in the UK. The venetian blind slats are available in 25 mm, 35mm, 50mm and 68 mm and they are presented online in Birch, White, Artic White, Light Oak, Cinnamon, Golden Oak, Pecan, Hickory, Walnut, Mahogany, Sugar Mapple, White and Dark Cedar. We supply them with colour co-ordinated headrails and ladder strings. Matching colour tapes are available as an option. The wooden blinds we sell are made from 100% natural wood and that is why colour variations might occur in accordance with the type of timber used or from one production batch to another. That is why the recommendable action would be for customer to place the order as soon as possible after receiving samples of slats in the post. 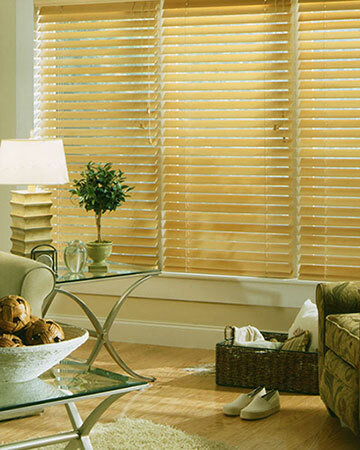 Please note that the blinds industry is different from other wood processing industries in terms of timbers used. For example, highly different from the flooring industry where a flooring named "Walnut" will be made out of the actual walnut timber, the blinds industry uses mostly basswood timber and then stains or paints the slats to resemble other wood species. That is why if a customer seeks to match a wooden blind to their flooring, it is advisable to first order samples to ensure a perfect match. Should a blind be made of the actual timber, the name of that product will include the word "real" eg. "Real Walnut".